* 'Cue & 2 * for 2p. BBQ Chicken Wings 12 pcs. Spicy chicken wings. CHALLENGE option will FREE of charge. Please ask rules !.. Velvety smooth and oh so good! Skin-on 'cause we like it rough! Thinly sliced cabbage and carrots tossed in a tangy dressing, it's a classic! Tu-Wed-Thur. 17.00 - 01.00 h.
Friday and Saturday 17.00 - 03.00 h.
Sunday 17.00 - 01.00 h.
Didnt manage high expectations. Meat was really dissappinting. Quite tasteless but worse was the dryness of the brisket. Inexcusable.. didn’t notice the smokiness in the meat. The Mac and cheese was gooey but lack taste. Worse was the fact they didn’t have any doggy bag available to take the food home. 5 was higher than it deserves. Just great really...service is perfect, served so quickly and so friendly. had the pulled pork burger and the brisket, which was totally succulent. The corn bread was a revelation. The vibe of the interior is cool and relaxed, beautifully rennovated, with soul music and dark wood. It's a great place to take people n your life who like places that are cool (but not TOO cool!) or love big portions of perfectly cooked meat. 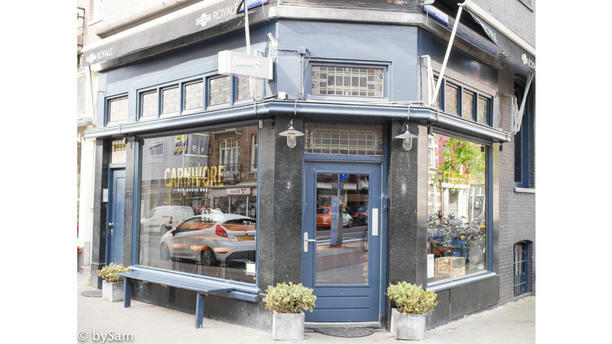 THE best restaurant in Amsterdam. My girlfriend and I have returned to the Netherlands twice now, just for this restaurant. Great service but slightly disappointing food - but the bean and corn side dish and the corn bread were amazing!! Meat was very dry, but the sides were very good! Service was very good and the ambience was cozy! Delicious barbecue and solid mac and cheese. Corn bread very fine crumb. Service with a smile, felt welcomed. Great Food... A taste of the South. Came here with a friend as part of the AH deal. The service was polite and pretty attentive. We had ribs, spare ribs, chicken wings, mac 'n cheese, cheesecake, and pecan pie, along with a few drinks. The spare ribs were pretty dry, the coleslaw was a bit bland, and the pecan pie was just OK, everything else was good; I think the chicken wings may have been the highlight. Great food and, surprisingly, a great selection of whisky! Best brisket I’ve ever had and I am from the southern part of the United States and eaten many briskets!! Amazing dinner.We were with large group dinner.They organize one all floor for us like a private diner.It was very comfortable. Best smoky meat I have ever had, from sides corn chill bean was perfect. Smoked Pineapple dessert was incredible, cinnamon with smokey pine apple matched great. Interior is cool like one of local hip restaurant in Greenwich Village in NY City. Perfect cocktails menu more than enough. Very close to Vondel Park. Fabulous meet , excellent service and delightful cocktails with good music and cozy ambiance. Friendly staff, good soul food although the cornbread served with the meal might have been a little bigger. Delicious meat, best ribs ever. Great choice of beers . Everything in a nice area of the city. Been here with my girlfriend and enjoyed it a lot . I will come back for sure . The meat was delicious as well as the elegant service. Five stars!!! I recommend this new restaurant to Amsterdamers. Top class.